This is “Policy Effects with Floating Exchange Rates”, chapter 10 from the book Policy and Theory of International Finance (v. 1.0). For details on it (including licensing), click here. The effects of government policies on key macroeconomic variables are an important issue in international finance. 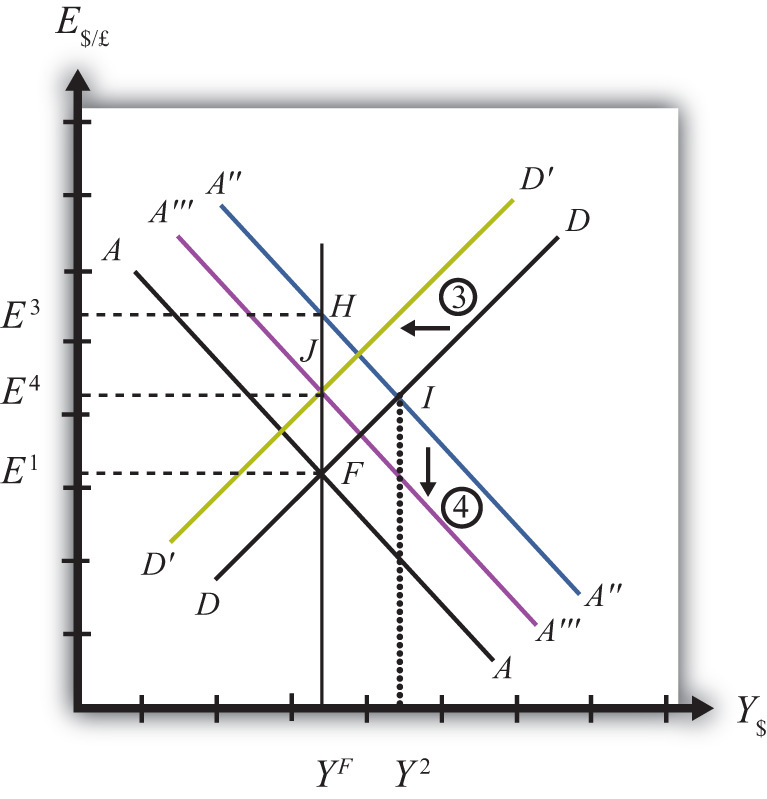 The AA-DD model constructed in Chapter 9 "The AA-DD Model" is used in this chapter to analyze the effects of fiscal and monetary policy under a regime of floating exchange rates. The results are more comprehensive than the previous analyses of the same policies because they take into account all the between-market effects across the money market, the foreign exchange (Forex) market, and the goods and services (G&S) market. Learn how changes in fiscal policy affect GNP, the value of the exchange rate, and the current account balance in a floating exchange rate system in the context of the AA-DD model. In this section, we use the AA-DD model to assess the effects of fiscal policy in a floating exchange rate system. Recall that fiscal policy refers to any change in expenditures or revenues within any branch of the government. This means any change in government spending—transfer payments, or taxes, by either federal, state, or local governments—represents a fiscal policy change. Since changes in expenditures or revenues will often affect a government budget balance, we can also say that a change in the government surplus or deficit represents a change in fiscal policy. When government spending or transfer payments increase, or tax revenues decrease, we refer to it as expansionary fiscal policy. These actions would also be associated with an increase in the government budget deficit or a decrease in its budget surplus. If the government acts to reduce government spending or transfer payments, or increase tax revenues, it is referred to as contractionary fiscal policy. These actions would also be associated with a decrease in the government budget deficit, or an increase in its budget surplus. 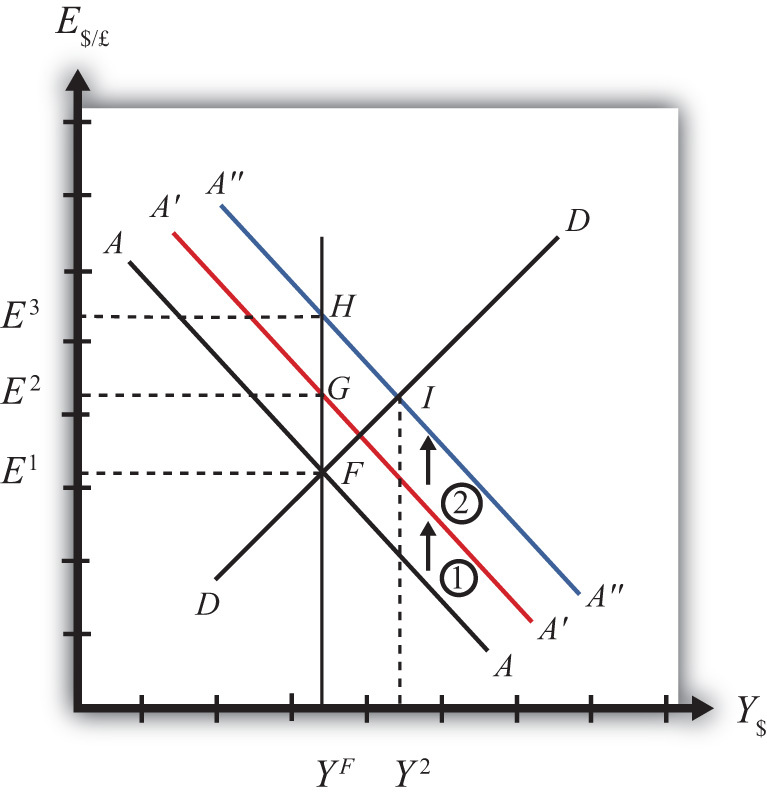 Suppose the economy is originally at a superequilibrium shown as point J in Figure 10.2 "Expansionary Fiscal Policy in the AA-DD Model with Floating Exchange Rates". The original gross national product (GNP) level is Y1 and the exchange rate is E$/£1. Next, suppose the government decides to increase government spending (or increase transfer payments or decrease taxes). As shown in Chapter 9 "The AA-DD Model", Section 9.3 "Shifting the DD Curve", fiscal policy changes cause a shift in the DD curve. More specifically, an increase in government spending (or an increase in transfer payments or a decrease in taxes) will cause DD to shift rightward (i.e., ↑G, ↑TR, and ↓T all are DD right-shifters). This is depicted in the diagram as a shift from the red DD to the blue D′D′ line. There are several different levels of detail that can be provided to describe the effects of this policy. Below, we present three descriptions with increasing degrees of completeness: first the quick result, then the quick result with the transition process described, and finally the complete adjustment story. The increase in DD causes a shift in the superequilibrium point from J to K. In adjusting to the new equilibrium at K, GNP rises from Y1 to Y2 and the exchange rate decreases from E$/£1 to E$/£2. The decrease in the exchange represents a decrease in the British pound value and an increase in the U.S. dollar value. In other words, it is a depreciation of the pound and an appreciation of the dollar. Since the final equilibrium point K is below the initial iso-CAB line CC, the current account balance decreases. (Caveat: this will be true for all fiscal expansions, but the iso-CAB line can only be used with an increase in G; see Chapter 9 "The AA-DD Model", Section 9.8 "AA-DD and the Current Account Balance" for an explanation.) If the CAB were in surplus at J, then the surplus decreases; if the CAB were in deficit, then the deficit rises. Thus the U.S. expansionary fiscal policy causes an increase in the U.S. GNP, an appreciation of the U.S. dollar, and a decrease in the current account balance in a floating exchange rate system according to the AA-DD model. If the expansionary fiscal policy occurs because of an increase in government spending, then government demand for goods and services (G&S) will increase. If the expansionary fiscal policy occurs due to an increase in transfer payments or a decrease in taxes, then disposable income will increase, leading to an increase in consumption demand. 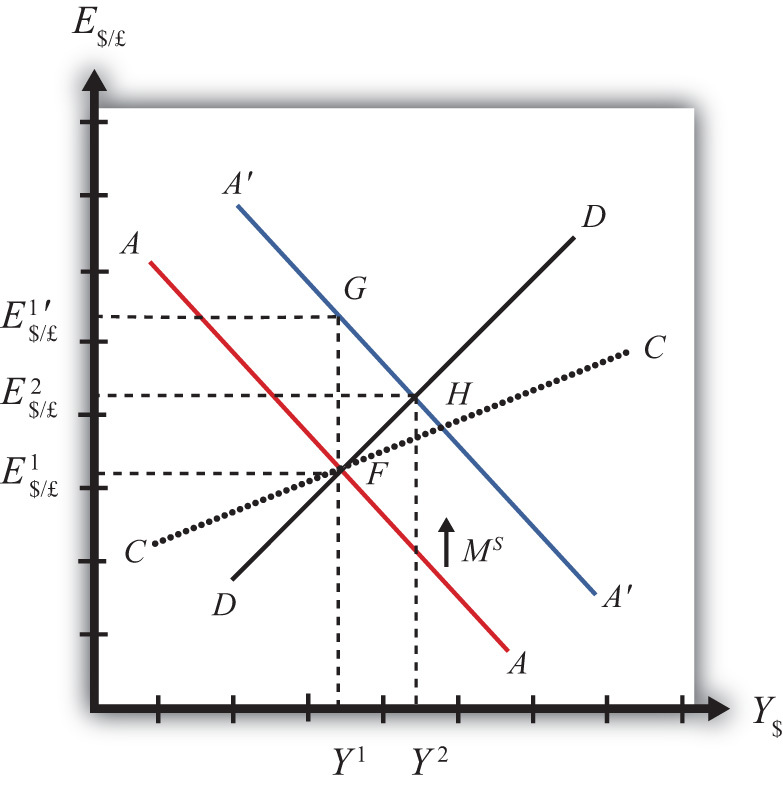 In either case aggregate demand increases, and this causes the rightward shift in the DD curve. 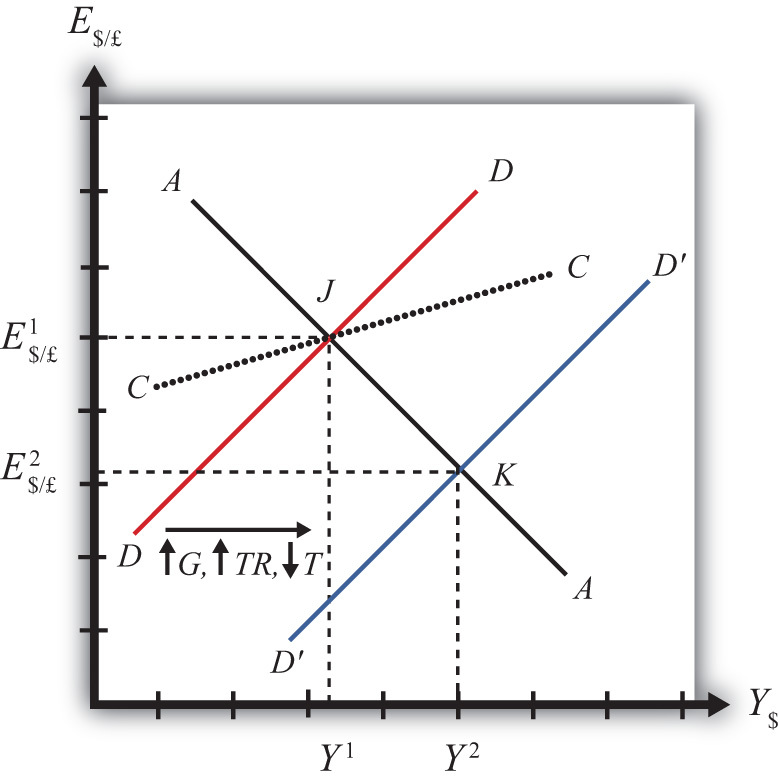 Immediately after aggregate demand increases, but before any adjustment has occurred at point J, the economy lies to the left of the new D´D´ curve. Thus GNP will begin to rise to get back to G&S market equilibrium on the D´D´ curve. However, as GNP rises, the economy will move above the AA curve, forcing a downward readjustment of the exchange rate to get back to asset market equilibrium on the AA curve. In the end, the economy will adjust in a stepwise fashion from point J to point K, with each rightward movement in GNP followed by a quick reduction in the exchange rate to remain on the AA curve. This process will continue until the economy reaches the superequilibrium at point K.
Step 1: If the expansionary fiscal policy occurs because of an increase in government spending, then government demand for G&S will increase. If the expansionary fiscal policy occurs due to an increase in transfer payments or a decrease in taxes, then disposable income will increase, leading to an increase in consumption demand. In either case aggregate demand increases. Before any adjustment occurs, the increase in aggregate demand implies aggregate demand exceeds aggregate supply, which will lead to a decline in inventories. To prevent this decline, retailers (or government suppliers) will signal firms to produce more. As supply increases so does the GNP, and the economy moves to the right of point J. Step 2: As GNP rises, so does real money demand, causing an increase in U.S. interest rates. With higher interest rates, the rate of return on U.S. assets rises above that in the United Kingdom and international investors shift funds back to the United States, resulting in a dollar appreciation (pound depreciation)—that is, a decrease in the exchange rate E$/£. This moves the economy downward, back to the AA curve. The adjustment in the asset market will occur quickly after the change in interest rates. Thus the rightward shift from point J in the diagram results in quick downward adjustment to regain equilibrium in the asset market on the AA curve, as shown. Step 3: Continuing increases in GNP caused by excess aggregate demand, results in continuing increases in U.S. interest rates and rates of return, repeating the stepwise process above until the new equilibrium is reached at point K in the diagram. Step 4: The equilibrium at K lies to the southeast of J along the original AA curve. As shown in Chapter 9 "The AA-DD Model", Section 9.8 "AA-DD and the Current Account Balance", the current account balance must be lower at K since both an increase in GNP and a dollar appreciation cause decreases in current account demand. Thus the equilibrium at K lies below the original iso-CAB line. However, this is only assured if the fiscal expansion occurred due to an increase in G.
If transfer payments increased or taxes were reduced, these would both increase disposable income and lead to a further decline in the current account balance. Thus also with these types of fiscal expansions, the current account balance is reduced; however, one cannot use the iso-CAB line to show it. The quick effects, however, are as follows. U.S. contractionary fiscal policy will cause a reduction in GNP and an increase in the exchange rate (E$/£), implying a depreciation of the U.S. dollar. Expansionary fiscal policy causes an increase in GNP, an appreciation of the currency, and a decrease in the current account balance in a floating exchange rate system according to the AA-DD model. Contractionary fiscal policy will cause a reduction in GNP, a depreciation of the currency, and an increase in the current account balance in a floating exchange rate system according to the AA-DD model. Suppose a country with floating exchange rates has a current account deficit that its government considers too large. 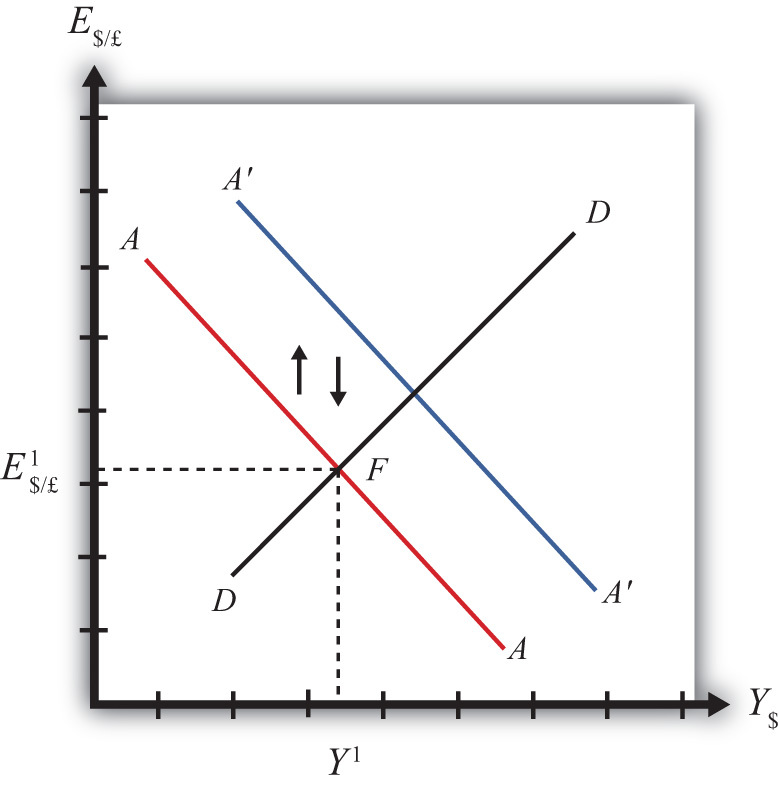 Use an AA-DD diagram to show how fiscal policy could be used to reduce the current account deficit. Does this action help or hinder its goal of maintaining low unemployment? The United States maintains a floating exchange rate. In the past few years, its government budget deficit has risen to a very high level. At the same time, its trade deficit has also become much larger. Suppose the government reduces government spending to reduce the budget deficit. Assume the U.S. economy can be described with the AA-DD model. In the adjustment to the new equilibrium, the following variables will be affected in the order listed. Indicate whether each variable rises (+) or falls (−) during the adjustment process. Learn how changes in monetary policy affect GNP and the value of the exchange rate in a floating exchange rate system in the context of the AA-DD model in the long run. If expansionary monetary policy occurs when the economy is operating at full employment output, then the money supply increase will eventually put upward pressure on prices. Thus we say that eventually, or in the long run, the aggregate price level will rise and the economy will experience an episode of inflation in the transition. See Chapter 7 "Interest Rate Determination", Section 7.14 "Money Supply and Long-Run Prices" for a complete description of this process. Here, we will describe the long-run effects of an increase in the money supply using the AA-DD model. We break up the effects into short-run and long-run components. In the short run, the initial money supply effects are felt and investor anticipations about future effects are implemented. In the long run, we allow the price level to rise. Suppose the economy is originally at a superequilibrium, shown as point F in Figure 10.3 "Expansionary Monetary Policy in the Long Run". The original GNP level is YF, and the exchange rate is E1. YF represents the full-employment level of output, which also implies that the natural rate of unemployment prevails. Any movement of the economy to the right of YF will cause an eventual increase in the aggregate price level. Any movement to the left of YF causes an eventual decrease in the price level. Next, suppose the U.S. central bank (or the Fed) decides to expand the money supply. As shown in Chapter 9 "The AA-DD Model", Section 9.5 "Shifting the AA Curve", money supply changes cause a shift in the AA curve. More specifically, an increase in the money supply will cause AA to shift upward (i.e., ↑MS is an AA up-shifter). This is depicted in the diagram as a shift from the AA line to the red A′A′ line. In the long-run adjustment story, several different changes in exogenous variables will occur sequentially, thus it is difficult to describe the quick final result, so we will only describe the transition process in partial detail. The increase in the money supply causes the first upward shift of the AA curve, shown as step 1 in the diagram. Since exchange rates adjust much more rapidly than gross national product (GNP), the economy will quickly adjust to the new A′A′ curve before any change in GNP occurs. That means the first adjustment will be from point F to point G directly above. The exchange rate will increase from E1 to E2, representing a depreciation of the U.S. dollar. Investors are very likely to understand the story we are in the process of explaining now. As we will see below, the long-run effect of a money supply increase for an economy (initially, at full employment) is an increase in the exchange rate (E$/£)—that is, a depreciation of the dollar. If investors believe the exchange rate will be higher next year due to today’s action by the Fed, then it makes sense for them to raise their expected future exchange rate in anticipation of that effect. Thus the average E$/£e will rise among investors who participate in the foreign exchange (Forex) markets. Investors may look to the purchasing power parity (PPP) theory for guidance. PPP is generally interpreted as a long-run theory of exchange rate trends. If PPP holds in the long run, then E$/£ = P$/P£. In other words, the exchange rate will equal the ratio of the two countries’ price levels. If P$ is expected to rise due to inflation, then PPP predicts that the exchange rate (E$/£) will also rise and the dollar will depreciate. The timing of the change in E$/£e will depend on how quickly investors recognize the money supply change, compute its likely effect, and incorporate it into their investment plans. Since investors are typically very quick to adapt to market changes, the expectations effect should take place in the short run, perhaps long before the inflation ever occurs. In some cases, the expectations change may even occur before the Fed increases the money supply, if investors anticipate the Fed’s action. The increase in the expected exchange rate (this means a decrease in the expected future dollar value) causes a second upward shift of the AA curve, shown as step 2 in the diagram. Again, rapid exchange rate adjustment implies the economy will quickly adjust to the new A″A″ curve at point H directly above. The exchange rate will now increase from E2 to E3, representing a further depreciation of the U.S. dollar. Once at point H, aggregate demand, which is on the DD curve to the right of H, exceeds aggregate supply, which is still at YF. Thus GNP will begin to rise to get back to G&S market equilibrium on the DD curve. However, as GNP rises, the economy moves above the A″A″ curve that forces a downward readjustment of the exchange rate to get back to asset market equilibrium on A″A″. In the end, the economy will adjust in a stepwise fashion from point H to point I, with each rightward movement in GNP followed by a quick reduction in the exchange rate to remain on the A″A″ curve. This process will continue until the economy reaches the temporary superequilibrium at point I. The next effect occurs because GNP, now at Y2 at point I, has risen above the full employment level at YF. This causes an increase in U.S. prices, meaning that P$ (the U.S. price level) begins to rise. The increase in U.S. prices has two effects as shown in Figure 10.4 "Expansionary Monetary Policy in the Long Run, Continued". An increase in P$ is both a DD left-shifter and an AA down-shifter. In step 3, we depict a leftward shift of DD to D′D′. DD shifts left because higher U.S. prices will reduce the real exchange rate. This makes U.S. G&S relatively more expensive compared with foreign G&S, thus reducing export demand, increasing import demand, and thereby reducing aggregate demand. In step 4, we depict a downward shift of A″A″ to A′″A′″. AA shifts down because a higher U.S. price level reduces real money supply. As the real money supply falls, U.S. interest rates rise, leading to an increase in the rate of return for U.S. assets as considered by international investors. This in turn raises the demand for U.S. dollars on the Forex, leading to a dollar appreciation. Since this effect occurs for any GNP level, the entire AA curve shifts downward. Steps 3 and 4 will both occur simultaneously, and since both are affected by the increase in the price level, it is impossible to know which curve will shift faster or precisely how far each curve will shift. However, we do know two things. First, the AA and DD shifting will continue as long as GNP remains above the full employment level. Once GNP falls to YF, there is no longer upward pressure on the price level and the shifting will cease. Second, the final equilibrium exchange rate must lie above the original exchange rate. This occurs because output will revert back to its original level, the price level will be higher, and according to PPP, eventually the exchange rate will have to be higher as well. The final equilibrium will be at a point like J, which lies to the left of I. In this transition, the exchange rate will occasionally rise when DD shifts left and will occasionally fall when AA shifts down. Thus the economy will wiggle its way up and down, from point I to J. Once at point J, there is no reason for prices to rise further and no reason for a change in investor expectations. The economy will have reached its long-run equilibrium. Note that one cannot use the iso-CAB line to assess the long-run effect on the current account balance. In the final adjustment, although the final equilibrium lies above the original iso-CAB line, in the long run the P$ changes will raise the iso-CAB lines, making it impossible to use these to identify the final effect. However, in adjusting to the long-run equilibrium, the only two variables affecting the current account that will ultimately change are the exchange rate and the price level. If these two rise proportionally to each other, as they would if purchasing power parity held, then there will be no long-run effect on the current account balance. The final long-run effect of an increase in the U.S. money supply in a floating exchange rate system is a depreciation of the U.S. dollar and no change in real GNP. Along the way, GNP temporarily rises and unemployment falls below the natural rate. However, this spurs an increase in the price level, which reduces GNP to its full employment level and raises unemployment back to its natural rate. U.S. inflation occurs in the transition while the price level is increasing. The final long-run effect of an increase in the money supply in a floating exchange rate system is a depreciation of the currency and no change in real GNP. In the transition process, there is an inflationary effect. Of increase, decrease, or stay the same, this is the effect on equilibrium GNP in the long run if the nominal money supply decreases in the AA-DD model with floating exchange rates. Of increase, decrease, or stay the same, this is the effect on the domestic currency value in the long run if the nominal money supply decreases in the AA-DD model with floating exchange rates. Repeat the analysis in the text for contractionary monetary policy. Explain each of the four adjustment steps and depict them on an AA-DD diagram.